A delicious Fall soup that is so tasty and easy to make! Peel and chop butternut squash into 1 inch cubes. In a large pot on medium high heat, saute garlic cloves and onion in olive oil. Once slightly browned and fragrant add in the cubed butternut squash and chicken stock. Bring to a boil then reduce to a simmer until squash is fork tender, about 15 to 20 minutes. 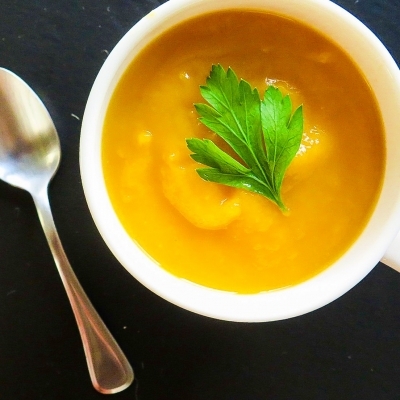 Once fork tender, ladle the butternut squash chunks into a blender and puree until smooth. You might need to do this step in a few batches depending on how big of a blender you have. Return the puree into the broth and stir well. Season with salt, pepper, and nutmeg to taste. Enjoy!